This interview was originally published by the Utah Theatre Bloggers Association on February 1, 2019. CEDAR CITY — Making a living in the arts has always been a challenge. But—as in many other fields—women experience challenges in the workplace that men do not have. Rather than talk about the problem, Utah-based actor and director Melinda Pfundstein decided to do something about reducing barriers that women face as they pursue their careers in the arts so she founded StateraArts with the help of USF actor Shelly Gaza. I sat down with Ms. Pfundstein in July to discuss Statera and its mission in more detail. UTBA: What is the mission of the StateraArts? Pfundstein: Statera, deriving its name from the Latin word for balance, takes positive action to bring women into full and equal participation in the arts. 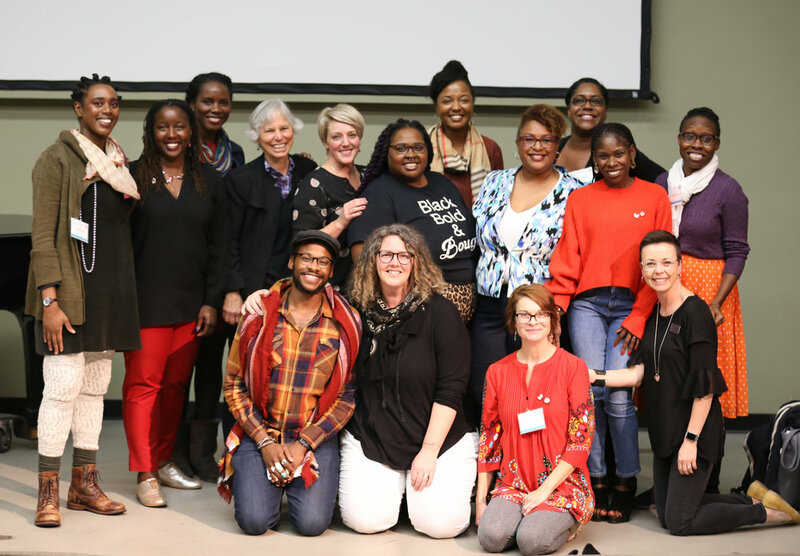 We work through mentorship, community and coalition building through our national conferences, and by amplifying women’s voices and work through international SWAN Day. We engage with organizations and women ready and hungry to do the work to help balance the landscape in the arts. UTBA: What does SWAN stand for in International SWAN Day? Pfundstein: SWAN stands for “Support Women Artists Now.” It was started 11 years ago by WomenArts founder Martha Richards and there have been over 1,900 SWAN Day celebrations in 36 countries around the world. UTBA: What do you encourage people to do on SWAN Day? Pfundstein: It is a grassroots movement that encourages communities of artists and arts supporters to gather, uplift, and celebrate women’s work. Some SWAN Day organizers use it as an opportunity to fundraise for arts projects in their communities. UTBA: That’s interesting. How was Statera founded? Pfundstein: The organization took shape on my back porch from years and years of the same conversations about the complications of being a woman in the theatre and the arts. There were so many women that we would see come and go and not advance through the organizations we were working in. But we were watching our male friends and peers doing just the opposite and grow in rank and in opportunities in directing and leadership. UTBA: How long ago was that? Pfundstein: That was in 2015. UTBA: So that was your back porch here in Cedar City, Utah. StateraArts’s logo symbolizes balance in the arts. Pfundstein: Right. But from there, we have team members and offices in L.A., the Portland area, Seattle, Denver, New York, and Chicago. We’re really spread out over the country. UTBA: This is really a grassroots network throughout all of the major arts centers in the United States. UTBA: So, with International SWAN Day, will we one day see Statera offices in other countries? Pfundstein: That is the hope. UTBA: You mentioned “complications” for women trying to advance their careers in the arts. What are some of the unique complications that women face? Pfundstein: From a very personal standpoint, I’m a mother and a wife. So, any time I go off to do a job, that is a factor for me. It’s great in organizations that I have worked with that have child care on the premises or that are supportive of families working for organizations. And in our organizations that mostly do productions from the classical canon, most of the roles available are for men. That means that men then become the loyal favorites, and pathways become built. And these men start to build up through the organization into leadership and directing positions that aren’t readily available for women. And there just aren’t a lot of examples for women to look to who have grown through the ranks into leadership opportunities in theatre. While there are many male allies and men who have done so, it is helpful to see somebody who looks like you in a pathway that makes sense to you. Pfundstein: Absolutely. Statera is about positive action and finding solutions. We like to work on the tactics that are working and to magnify them. UTBA: You mentioned that the roles in the classical canon are disproportionately male, and here we are at the Utah Shakespeare Festival. Shakespeare‘s most famous play, Hamlet, has two female characters. You directed a play this year, the Merchant of Venice, that has three named female characters. Tell me about how, given this issue, how you handled that to make this play more career-friendly for your female performers. Pfundstein: With Shakespeare, in particular, we already go to the theater and suspend our disbelief about so many things: that a cardboard thing is a tree, or a piece of wood is a house or a village. But also there is a tradition of men playing women’s roles. So, this is not so much of a stress. It’s just about asking smart questions about what lens we can look through to think more creatively about themes based in human experience. I think that’s something that we do every time come to these plays. This time it happened to be a marginalization lens that I looked through. UTBA: You cast four women into five roles that were written for men. Why did you cast those particular women? Pfundstein: I cast those particular women because of their artistry. When The Merchant of Venice came to my plate, the first person I thought of was Lisa Wolpe because I heard her speak those words a year ago, and it haunted me. The casting grew from there, and they were the best people for the roles. UTBA: That’s quite an endorsement for those performers. Beyond this particular production, what success stories do you have for Statera? Pfundstein: Recent success stories that resonate for me are about individual artists who bring a new show to the national conference. Out of that, they then book performances at theaters across the country. There are also stories of people engaging with mentors and being shepherded through their pathway in the arts. It’s about connecting with women and male allies all over the country and internationally. UTBA: Are there women who have been offered directorial positions because of Statera’s work? Pfundstein: Absolutely. We’re connecting people and having conversations about the work and new ways of thinking. Those relationships automatically blossom the same way that they do for our male allies. We’re just seeing it more frequently now. UTBA: Are there some jobs and positions that are more representative of women than others? Or is it more consistent across the board where you see the same level of representation in different positions? Pfundstein: The American Conservatory Theater in San Francisco and the Wellesley Centers for Women put out a study a couple of years ago about women in leadership in the theatre. You can get some statistics from there. But right now we are in the midst of the biggest turnover of leadership in the American theatre ever. So, right now this is on so many people’s tongues because we’re talking about what we can do to ensure that the work stays relevant in the future. So much of that has to do with making sure we get more diverse voices in leadership positions. That hasn’t been the case previously. UTBA: It sounds like you started your work at the perfect time, right before you start getting this massive turnover in leadership. It sounds like you having this conversation going about getting women in directorial positions and artistic directing positions, those positions are really starting to open up for various reasons anyway. Now seems like the perfect chance to give female candidates a shot. Am I understanding that correctly? Pfundstein: You are. I offer that it we have had the perfect chance to give female and diverse candidates a shot. We have simply been stuck in old, outdated habits and systems, but now we know better, and it is time to do better. UTBA: That’s interesting. For yourself, you mentioned that you had particular challenges for yourself in your career. What changes have you seen in the industry over the course of your career in addressing this issue? Pfundstein: The first thing is that this is on the tongues of the industry. The whole industry is talking about how to make this a more diverse landscape. Just that it’s a conversation piece at so many organizations is totally different than it was when I was starting. And women are starting to step into these positions: women, women of color. They’re stepping into these positions of leadership, and that makes it better for all of us. There also more opportunities now. I also have more examples now—and perhaps it’s because of this work where I’m connecting to them now—but more examples of women who have taken a pathway that makes sense to me in growing and progressing in the industry. UTBA: Besides the conversation actually happening, what is the #1 difference for a female artist starting her career now compared to 20 years ago? Pfundstein: We have Statera. There is opportunity for mentorship, free resources, a place to convene once a year to connect to other artists who are interested in this conversation, and a growing community of makers and advocates forwarding the work. Organizations are implementing equity, diversity, and inclusion programs that are more than just lip service now. Where once these peripheral programs were created to check boxes, now companies are implementing them into their day-to-day operations. That is making a huge difference. They’re acting as examples for other organizations who want to broaden their teams and diversify the voices in their organization. UTBA: It reminds me of a panel at a conference of the American Theatre Critics Association that I went to in 2015 where female playwrights talked about a real change in moving their work from being at women’s-only festivals or being produced as the one play per year written by a women in a company’s season to being an integral part of the season at theatre companies. Do you see a similar movement happening in acting roles, directing positions and design jobs, where there is an effort to make a large number of women part of the creative teams? Pfundstein: Yes. More organizations are moving beyond the tokenism of adding women or people of color in and instead doing the hard and important work of implementing the value of doing art by and for more people into their missions. I believe that these organizations will thrive and those that do not will become irrelevant and struggle. UTBA: What can patrons do? Most of UTBA’s readers are not artists. Pfundstein: Women buy 70% of the tickets in the arts. They ought to see themselves represented in the art they buy. Simply buy tickets that support art done by and for more people. Contact your arts organizations and say, “I really love this and want more of this.” That feedback for organizations is great. UTBA: I appreciate you giving me the time to talk about this. Is there anything else I should know about Statera or its work? Pfundstein: Statera is not just about giving artists opportunities. It’s about allowing the arts to reflect back a picture of all our audience members, and not just a certain type. All audience members deserve to see representations of themselves because the arts inspire us to consider what could be. This work makes the arts landscape better for all of us. UTBA: I see it as common sense. The more people who see the arts as being relevant to their lives, the more people will come to the defense of the arts when funding is in danger. It makes sense from the patron’s perspective, from the producer’s perspective, for the artists, and everyone. It makes sense to have more voices and a broader pool of support. To learn more about the StateraArts, visit stateraarts.org. To help further Statera’s mission, make a donation at stateraarts.org/donate.